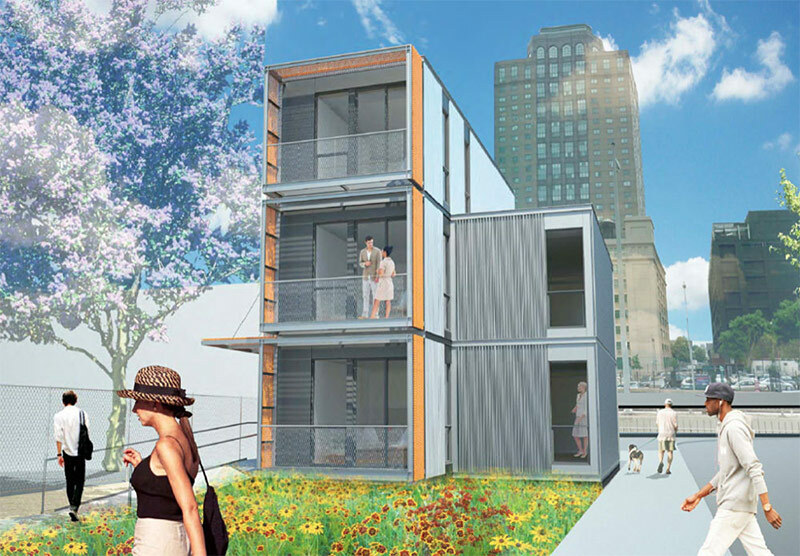 Brooklyn-based Garrison Architects, a firm well-known for its sustainable modular buildings, and American Manufactured Structures and Services, have collaborated on the design of a prefabricated disaster relief housing prototype, which will be displayed in Downtown Brooklyn this summer, as part of an effort to help rebuild post-Hurricane Sandy with a focus on sustainability. The three-story, three-unit modular test structure will be situated next to the Office of Emergency Management (OEM) on Cadman Plaza. 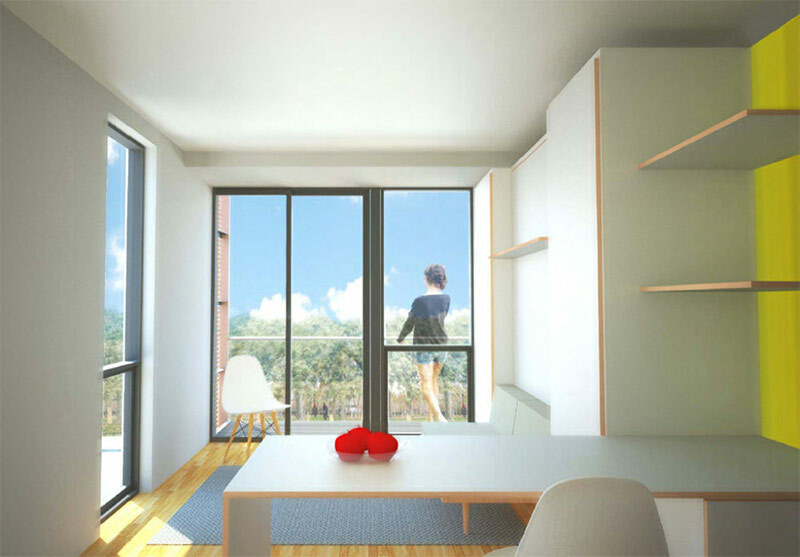 The ground floor will be a handicap-accessible 480-square-foot one-bedroom unit, and the upper two floors will consist of two separate 822-square-foot three-bedroom apartments. The preassembled and pre-furnished units will be 12-feet wide by 40-feet long. Once shipped to the site, they simply need to be clipped together and connected to utilities. They also feature balconies that help lower solar-heat gain, provide larger windows, and supply more habitable space. Garrison Architects principal Jim Garrison told the New York Post that the units can stand alone but are also “designed to operate as a row house and be deployed on a city block.” The prefab structures will cost about $1.14 million paid for by the U.S. Army Corps of Engineers and will include gardens in back and parking in front. They can be assembled to form a secure perimeter around an urban street and can be outfitted with photovoltaics to generate their own electricity. Garrison said that the design, which complies with all city codes, would eventually be utilized for high-density, four-story urban housing. 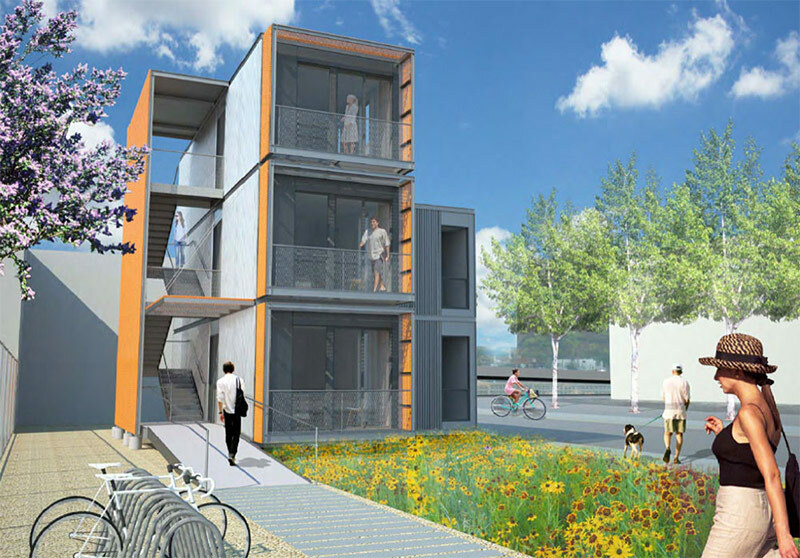 OEM and the Department of Design and Construction have been working since the “What If NYC” design competition in 2008 to create a prototype for disaster housing. When Sandy hit four years later, nothing was prepared. Now, after the establishment of more detailed requirements for local codes, the project is ready to go. 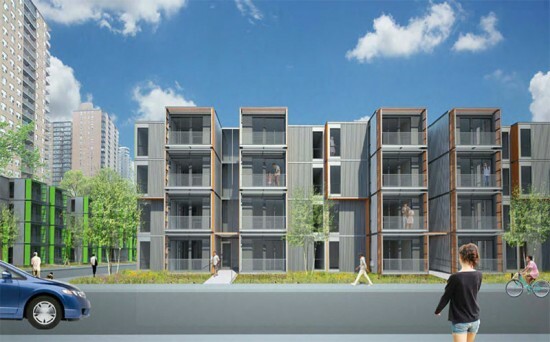 Construction is expected to begin soon and test residents will move in for several months to offer feedback on how the units work so the design can be modified. View more technical drawings of the structure here.